Erastus Bingham Sr. and Lucinda Gates are the parents of Erastus Bingham Jr. who married Susan Green. Erastus Jr. and Susan Green are the father and mother of Nephi Bingham. My father, Nephi Bingham, was born April 9, 1858 at Ogden, Utah. His mother, Susan, was the first white woman to live in Ogden. The others were Indians. They soon moved to Huntsville where the rest of his family was born. As he grew older, he had inflammatory rheumatism so bad he couldn’t stand the cold weather in Huntsville. So he moved to Silver City, New Mexico where his brother Daniel lived. They worked hauling ore from the Florita Mountains to Silver City. Uncle Dan was married to Eliza Hoover the 8th of April 1886. Their first son, Esdras, was born May 30, 1887. Mother had a sister living in Silver City. Her husband was working with my father and Uncle Dan. My mother came from Durham, England to Silver City to visit her sister. She arrived the 1st of July, 1887. Father went with her sister and husband to meet the train. They fell in love at first sight and they were married the 31st of July, 1887 in Silver City, Arizona. Mother’s sister and all her family disowned her because she married a Mormon. Her sister went back to England, that was the last time she saw any of her family. The next year, Uncle Dan and family moved to Phoenix, Arizona and my father and mother moved back to Ogden, Utah. Their first two children were born in Ogden. Rebecca was born January 2, 1889 and Mae (Susan Mae) born June 14, 1890. His rheumatism was hurting him again in that cold country so he decided to go to Arizona where it was warm. His father and mother told him if he would go by Mancos, Colorado so they could see their other daughter, Clara, and some of their other family living there. They were Aunt Lucy and Harriet Wheeler, who married Joseph, and Aunt Letty and Uncle John went with them. They were all married. Those that went with them were Aunt Clara, Aunt Gina, and Uncle Jacob, who was 15 years. There were others going along and several covered wagons. They all journeyed for days. When they got near to the Colorado River near the crossing, he stopped his wagon as he was the lead one, told them all he wanted to do some looking around. Uncle Jacob, Nephi’s youngest brother, age 15, was riding with him so they went down to the river, he looked down the river. There was a big ledge where the water had washed way back under the ledge all the ground. Below there were broken wagons, skeletons of horses, and skeletons of people. They went back where his wagon was. He told all of them waiting in their wagons that he wanted to drive all their wagons down to the river and across as he wanted to make a circle around and not go near the ledge as it might cave in. He drove every wagon down and across river. They were all overjoyed and thankful to think he would risk his life for all of them. They arrived in Mancos, Colorado in June. My sister Clara was born July 3, 1892. When Grandpa and Grandma had their visit out and Mother got strong enough, they journeyed to Arizona. His father and mother and all the rest of the family stopped at Vail, a little place twenty-two miles southeast of Tucson. My father, Aunt Violetta, and Uncle John Holt went to Nogales. Mother and their three girls; Rebecca, Mae and Clara; went on to Casa Grande, Arizona. Father leased the Scribner’s place. He stayed there two years. I was born there. Later, he moved to Arizola, a little siding where trains could pass one another. It was a new track of land. He cleared the land of sage brush, made fences of hog wire, and stocked it with hogs. The water was very bad, with alkaline. Glen was born there. Then, all of us moved back to Casa Grande on the Taylor Place. He made a few trips to Florence, Arizona to visit his brother Dan and his family. They moved from Phoenix. Uncle Jacob came from Vail to Casa Grande to help Father on the ranch as Father’s health was bad. My brother Floyd was born August 13, 1889. A year or two later, Uncle Dan and family moved to Kennelworth. It is now called Coolage, not too far from Casa Grande. Later, in 1900, Father sold all his hogs and shipped them to market and moved to Tucson, Arizona. A few months later, Uncle Dan moved to Tucson. Tucson wasn’t very large at that time. It had one street called Congress Street. It wasn’t paved. Two grocery stores—Wheeler, Perry’s and Ivonich. The dry good stores were La Banzo and Rosies, and a watering trough for the horses. My father located a place called the Davidson Place on the northern side of the Rillito River that ran the year around. That was where they got the water to irrigate the farms. Father wrote his father living in Vail. They came to live by us—Aunt Clara, Aunt Gina, and Uncle Jacob. Aunt Violetta (we called her Aunt Letty) and Uncle John Holt came in from Steim Pass, New Mexico. He was working for the rail road. Uncle Erastus, we called him Uncle Ross, and Aunt Annie came from Ogden. Aunt Letty and Uncle John moved into Tucson and later to Richfield, Utah. Aunt Clara to Tucson, then to Ogden. Uncle Jacob stayed with my father. He was married then to Francis Harris. Grandma and Grandpa moved to Mesa where the Mormons were living. My father stayed a year. My father and mother and family moved to the Manning Ranch. Uncle Enock went with us. It was west across the railroad tracks. We didn’t stay there very long. The water was bad, typhoid and malaria everywhere. The Santa Cruz River water smelled awful, the well water was bad to drink, Glen caught typhoid malaria fever. Doctor thought he couldn’t live. Father stayed with him night and day for months. All of us felt so sorry for him. Floyd cried because he couldn’t go in the room to see Glen. Father was afraid the rest of us would catch it. He would give all of us jobs to do. I had several jobs so Floyd could go along with me. I had the chickens to feed and chicken houses to close at night. And the ducks to find in the early evenings. They would go every day up the ditch to Mrs. Boyshey’s place, it was a half a mile or more, and they had ducks and we would have to go get them home before dark. We had long willow sticks and would walk in the ditch bank to shoo them along. We would get them home before dark. As spring came, Glen got better but had to learn to walk. He had lost all his hair and it came back red. He didn’t like that and cried about it but it changed back to a light brown. He was so tender hearted and cried so easily after being sick so long. But soon we moved to the Hall Ranch. We called it the Hall Place as the ones that had lived there were the Halls. Mr. Bayless had bought the place and hired my Father to farm it. The land had to be cleared of mesquite and catclaw and the ground had to be plowed. Snakes everywhere. He had to build reservoirs to store the water for irrigating. He had to hire Indians from an Indian village south of Tucson to help on the farm. He had a little Mexican man named Chapo Verdugo that did run the mowing machine and do what the Indians couldn’t do. Father would go get the Indians. They lived a short distance down in the field where there were two little adobe houses and they made some little hogans so they all had shelter. The more land that was cleared and planted, the more water he needed. The springs he got the water from was miles up the river and brought down in ditches to the reservoirs. The head of the ditch had to be cleaned at times as cattle would get in it and overflow the ditch banks. When plowing and clearing the land, snakes were everywhere and all had to be careful not to get bit. The summers being warm, they crawled everywhere. One day I opened a dresser drawer, there layed a field snake. Father was a good farmer. He had alfalfa, wheat, barley, and oats. All kinds of vegetables, strawberries, fruit orchards. A dairy he had the Ayshire cattle and won ribbons in 2nd and 3rd. He sold the cream to the ice cream parlors. Father shared with all that didn’t have much. He gave to the poor and the needy and the widows and he would always say “it’s better to give than to receive.” Every time he took vegetables to the store, he took to the orphans home. He had three big reservoirs. The wild ducks flew in by the hundreds. Glen and Floyd would go duck hunting every morning. They would sell the ducks to the grocery meat market. They enjoyed duck hunting. But one morning Glen and Floyd went, they took their dogs Shep and Tob with them. When they shot the ducks the dogs would swim in the water and bring them to the bank. But one morning, just as Glen went to shoot, Shep jumped in and he shot him. He grieved for days and missed a week of school and wouldn’t go duck hunting again. He was always so tender hearted after all he had been through. By that time, Rebecca and Mae had finished school and Father planned to send them to Colonia Juarez, Mexico to college September 9, 1909. My father would take the older girls, Rebecca and Mae, to dances at the fireman’s hall. When Clara and I got older, he would take the four of us. He would hire preachers of different churches to speak and invite all the people to hear them. Mother was not a Mormon. My father, Rebecca, and Mae left for Mexico. My father did have a sister living in Dublan not very far from Colonia Juarez. His sister and husband had passed away, but all their children were living there. He visited a few days with nephews and nieces. When he came back to Tucson, Heber Farr, his sister’s oldest son and his brother-in-law, Charles Hurst, came with him. They looked over the old Davidson Place and decided to move to Tucson if it was agreed with the ones in Mexico. My father helped them to finance their covered wagons and horses to make their trip out of Mexico to Tucson. My father began to make plans to have plenty of food for them when they arrived. My father’s younger brother, Jacob (we called him Uncle Jake), lived near us and he made plans along with him. My father owned a dairy and had plenty of milk. He butchered a pig and cured it. We had turkeys, ducks, chicken and eggs, plenty of bottled fruit, our orchards, dried corn and beans, dill pickles, sauerkraut, pumpkins, five gallons of homemade mincemeat, and a winter garden. A few days before they arrived, Father killed a beef. He would hang it outside in the cool of the night and then take it down in the morning and wrap it in sheets and then a canvas to keep the cold in. On December 15, 1909, in the afternoon light, covered wagons came rolling out of the catclaw and chaparral bushes down the lane to our home. It was a wonderful meeting to see them all for the first time. They parked their wagons between our home and Uncle Jacob’s home. Some of them were very sick when they arrived. The sick and the old slept in our home and Uncle Jacob’s home and the others in their covered wagons. They all ate their meals in the two homes and would come and go as they pleased in the day time. We had Christmas dinner together. Those that came out of Mexico at that time were the five of the Farr brothers, their wives and family. Heber, Joseph, Earnest, Wilford, and Ascel not yet married. The sisters were Edith and Lindy, their husbands and family, and Mamie Farr was not yet married. There were in-laws and their husbands and wives and family. We all had Christmas together. There was a small wooden schoolhouse nearby where all the children went to school. They were all busy building little tent-houses to live in until they could build better ones. They would build the floors first then board them up on the sides and the ends, leave a space for the door, then they would put a tent over it. They were all busy getting their crops planted. Heber and Joseph and the Williams lived across the Rillito River on the north side of the river. It supplied water for irrigating the farms. All the others built their homes on the south side of the river. The Farr brothers farmed, the brothers-in-laws ran a dairy. Father had Mormon missionaries and mission preachers coming for years. On May 21, 1910, my father and Heber Farr met the train from Salt Lake and California to get Brothers George Albert Smith, Joseph W. McMurrin and Joseph E. Robinson. 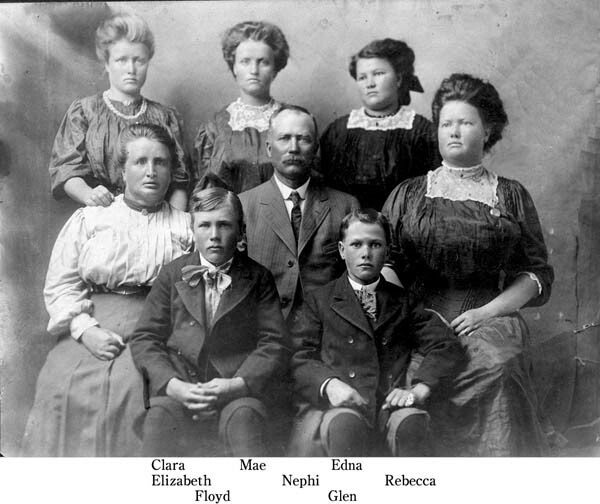 That afternoon, my father, my mother, my sister Clara, my bothers Glen and Floyd, and myself, Edna, were baptized members of the Church of Latter Day Saints. The following Sunday, May the 22, 1910, the first branch of the Church Jesus Christ of Latter Day Saints was organized in the shade at the east end of our home. The opening prayer was given by President Joseph E. Robinson. The branch was called Binghampton Branch after my Father. There was already a little town called by Bingham in Arizona. Heber Farr was ordained branch president, Frederick Granger Williams first Counselor and Frank Webb second Counselor. We were all confirmed members of the Church of Latter Day Saints. The sacrament was blessed and passed, talks were given, and the closing prayer was given by Joseph A. Farr. Church services were held under big shade trees at the east end of Heber Farr’s home. On the 4th of June 1910, a blessed event happened after twelve years—another little boy came to live with us. Father and Mother named him Delbert. How wonderful it was to have a baby in our home. We were so happy and loved him so much as we couldn’t remember when we ever had a little baby in our home. After my Mother didn’t have enough milk, Father would take him every morning to Heber Farr’s. My father was trustee of the Davidson school. He received permission to build a large school house as more saints moving out of Mexico settled in Binghampton and near Jaynes Station east of the railroad tracks. It is now called the Flowing Wells. They cleared the land of mesquite and catclaw for some company. By the middle of September, the large school was built. All the people would come to Church and the young ones would come to the dances at Binghampton one Saturday night and the ones that lived in Binghampton would go the dances the next Saturday night at Jaynes Station. Some of the young boys worked for my father on the farm. My father furnished transportation for all that wanted to go to the dances from Binghampton. Father had two spans of mules, a big hay rack the boys would fill the rack with hay, stretch canvas over it, and all us girls would furnish quilts to put over the canvas for comfort. He gave us a little cow bell and told the driver not to whip the mules, just ring the bell and they would go fast enough. By the middle of September 1910, the big school house finished and my Father asked permission to hold Church services in the school house. He had the little schoolhouse added to the south end of the new building. There was room for a stage and two Sunday School class rooms. At this time, the Sunday School was organized. Joseph A. Farr was ordained as superintendent of Sunday School, Elmer Cardon as first assistant, J. Alma Young as second assistant, Ellen Bluth as secretary, Heber O. Chlarson was set apart as Ward Clerk. Relief Society was organized with Elizabeth Farr as president and Mae Bingham and Lindy Young as her assistants, Hazel Williams as secretary. School had started. Floyd and Glen went with Father and Mother to buy some shoes. I stayed at home with our little baby. Soon after they were gone, Rebecca Mae and Clara saddled up the horses and went for ride. They hadn’t been gone very long when they remembered that Father told me to be sure to pick some corn for supper. Mildred Smith was visiting me from town. I didn’t know what to do—when Father told us to do something we had to do it. We went to the corral and got old Roudy the horse and hitched him up to the buggy and went across the river to pick some corn. We tied the horse to fence post, then we dug a shallow place in the sand, put a blanket over it, put the baby in it so he couldn’t roll out. It was a cloudy day and we thought he would be alright. It was just a short distance from the baby. We had aprons with strings on. We had picked some corn just a little ways from the baby but I heard a wee small voice say, “go to the baby.” I pulled my apron string and ran. When I got near the baby, there was a big snake crawling over the bank down where the baby was. I grabbed his little foot and pulled him out. I cried for joy loving him. Mildred ask how did I know the snake was there. I told her I heard a voice say, “go to the baby.” She said, “I didn’t hear it.” We were trying to kill the snake when two men fixing the fence came by and killed it. It had ten rattlers and a button on it. I told Mildred not to say anything about this to my parents as I wanted to tell them myself. When supper was over and Father and Mother had gone to bed, I went out on the sleeping porch. I told them I had something to tell them. I said, “Papa, do you remember explaining the Godhead to me? God the Father, his son Jesus Christ and the Holy Ghost and the wee small voice.” I told him I had heard that wee small voice, then I told him the story of the snake. I was crying as I told it. He told me not to cry, that the baby was alright and safe in his little bed and you will have a wonderful testimony of truthfulness of the Gospel all your life and you will never forget, and I haven’t. I can see it as I did sixty-eight years ago. Father was always at the table in the middle of the living room reading scriptures from the Bible and Book of Mormon and the Doctrine and Covenants and was in the center of table. He carried the Doctrines in this hip pocket all the time until it was shaped like his pocket. When he went down into the field to see how the working men were doing, he would get in the shade and read. Tucson was growing with all kind of business—banks, flour mills, schools, banks, homes. When the Mormon people in other towns heard of a Mormon Church being near Tucson they came from St. David, Benson, Bisbee, Douglas, Safford, Thatcher, and Duncan to Tucson to get work. Gordon Kimble came from Safford. He got a job working in a bank soon. His brother Spencer W. Kimble came to go to the University of Arizona to school. He drove a taxi to help his way through school. That was in the year 1912 and 1913. They all went to Bingham Place to Church services and entertainments. By that time the Church was full and the dances were crowded, and there were lots of school children. My father, being school trustee, he was called to help the school teacher Hattie Webb to settle mischievous things that went on in the school room. One morning when the school bell rang and the teacher called the school to order, she touched a little lever under her desk to get a ruler out a drawer and mice and rats jumped everywhere. At noon she sent for my Father to come the schoolhouse. It was sure funny. She was talking to him all about it. Father must of had a smile on his face. I was standing by the door and heard her say “Brother Bingham, its not funny.” Well, there wasn’t any more rats and mice put in the teachers desk. Those were the good old days. Never saw so much love for one another and the way people helped one another. Every fall his nephews would help Father cut milo, maize and other things to put in the silos for the milk cows to eat. We all worked. Besides attending Church and Church services we would go to dances. On one night a week all the young folks would meet at our home and play run sheep run and two and threes. Then we would have ice cream and cake and go home. Father always said work and no play makes Jack a dull boy so he mixed them. Everyone loved him and my mother. They were Uncle Nephi and Aunt Lizzy to everyone. And they all liked to come to our home. Soon, my other three sisters—Rebecca, Mae, and Clara were married, one in 1911, one in 1913 and one in 1914. In the spring of 1915 I met a tall, dark, handsome man and we were married October 15, 1915. He worked for the Southern Pacific railroad. He was foreman of a signal gang that was laying rails along the tracks, and his work was to have men hook the rails underground to the signal so when the trains would come near it would turn the red blade or the red light of the signal up to let the train men know there was another train coming. We lived in a little boxcar house in the siding on another track. When the installation was finished, we moved to Wilcox. I had a pass to ride the trains and I visited Father, Mother and the boys often. I saw them every month or so. They were all so glad when I would write and ask them to meet the train. It seemed like every time I would go see them it would rain. Father made a joke out of it. When it got dry, Father would say to Mother, “write Edna to come so it will rain.” Mother did write me, it was the middle of July and I went to Tucson. Father met the train, he was pleased that I came. He had an accident with the buggy and horse. But a week later, he had pneumonia and complained of a pain on his chest. We called the doctor and his chest was bad from an accident. He got worse and he wanted to see his brother Daniel. So, we wired Uncle Dan and he came from California. It seemed to cheer him up and he felt better. He hadn’t seen him in years. I then wrote Fred and he came. He and Uncle Dan would take turns sitting with him. Aunt Lucy came, but he didn’t live but a few days. He passed away at five minutes past 2 a.m., August 2, 1916. It was very warm those days, so the funeral was held that afternoon. Uncle Jake and Grandma came from Sonoita. He was buried in a little place he had picked in the foot hill to bury a Mr. Farrs in 1902. Its a peaceful place now with hundreds of graves. Its called the Binghampton Cemetery. Next day, Fred and Uncle Dan went home. I stayed with Mother a while until she got adjusted some to Father being gone. I stayed two weeks. She said, “you go home to Fred. I have Glen and Floyd and Delbert with me and he is alone.” I went back to Estrella, Arizona but went often to see her. We moved to Tucson later that fall and lived near Mother. We were making plans to go to the Temple to do temple work. We moved to Tucson and lived in a part of Mother’s home. A little girl came to live with us, we called her Margaret. She was born July 8, 1917. When she was three months old, we couldn’t get passes riding over the Union Pacific railroad. We went on the Southern Pacific railroad trains to San Francisco and on into Ogden. Mother and the three boys—Glen, Floyd and Delbert—went on the Southern Pacific train to Colton. They changed trains to the Union Pacific train and we met them in Ogden. Visited some relatives there and a few days later we all went to Salt Lake to the Temple. Mother was sealed to Father. Glen, Floyd, Delbert and myself Edna, were sealed to Father and Mother. Fred and I were sealed to one another and Margaret sealed to us. Mother made another trip to the Saint George Temple to have Mae and Clara sealed to her and Father. Mae and Clara lived near Mother. That same year we moved to Tucson from Estrella and lived by Mae near Mother’s home. She moved to Hurricane, Utah about a year later. We moved in part of Mother’s house until the first of November of 1918. Fred got a good offer of a paying job in Deming, New Mexico. He had to take it by the first of December or lose it. He didn’t want to leave until our second baby was born and he told the railroad official he wouldn’t leave my until the baby was born. When he got home that Saturday evening from work, he was pleased that the baby had come to live with us. We named him Fred Jr. He called the railroad Signal Department and told them he would take the job. He shipped all our belongings and left the following week. By the end of the week, the 3rd, I was over to Deming, New Mexico. There was a big snow storm. We had to walk a block or more to our little box car home. It was sure cold as it was dark. It was during the first world war and Camp Cody, a military post, was there. The town was crowded with parents of soldiers. There was no place to rent, so the Southern Pacific Rail Road Company put nine box cars in that one lot for workers to live in. It was sure a crowded neighborhood. The snow storms was awful. Next day, I wrote Mother as she couldn’t stand to see me leave with two little ones seventeen months apart. It was during the flu epidemic and people were wearing masks, as people were dying by hundreds. I went often to see Mother and she was always happy when I wrote her I was coming. I could get free passes to ride the trains so I went every three or four months to see her. My three younger brothers ran the dairy and the farm. They were young, but smart, and kept the dairy and farm going. In 1918, Floyd was married to Lavita Nelson and months later Glen married Lydia Nelson, a cousin to Floyd’s wife. They all lived near Mother and Delbert on the farm. Then Floyd bought some land along the San Pedro River and moved up there and stocked it with cattle. Glen ran the dairy and the farm. They both had large families. Lavita came back to Tucson to live during school season to let the children attend school. Mother lived on Ranch with Delbert. When he was married, she still stayed there until she passed away. My father helped his neighbors all the time when they were planting their crops by loaning them machinery like bailers to bail their hay and rakes to rakes machinery.